By Jess Clevenger – It’s the most wonderful time of the year, and if you’re anything like me, it’s a wonderful time of the year for baking. Not only do desserts make great handmade gifts, but it’s so nice to have a sweet treat on hand for when friends and family get together this time of year. Shiny ornaments hanging from Christmas trees, bright lights strewn across rooftops, piney wreaths hanging on every door… there’s just something about the sights of the holidays that warms your heart and soul. Walk through the cozy town of Gettysburg during the holiday season, and you’ll be sure to get that feel good feeling. We’ve compiled a list of stops you’ll want to visit to get in the holiday spirit this year! By Carl Whitehill – Yikes, believe it or not, the holiday season is here. Sure, some of you have been probably shopping for weeks, but for the rest of us, there are still people in our lives for which ideas don’t come easily. Before you frustratingly sort through the neckties or get your mother yet another purse, take a look at our list below. Gettysburg goes great under the tree! We’re celebrating fall and the beginning of the holiday season in Gettysburg, Pa., with this pear harvest bread, a recipe courtesy of one of our countryside fruit markets – Boyer Nurseries and Orchards. Warm ginger, zesty lemon, toasty walnuts, caramelly brown sugar and sweet, juicy pears are combined to make this comforting, festive bread. Gettysburg, Pennsylvania has often been described as one of the most patriotic places in the country. 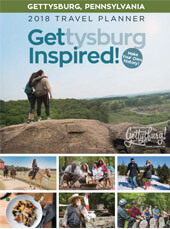 Throughout the year, there are attractions and events that celebrate and commemorate Gettysburg’s – and America’s – rich history. Patriotism is the pride and devotion to one’s country and Gettysburg gives visitors ample opportunities to feel just that. Here’s a list of places and events you can visit if you’re feeling patriotic in your travels to Gettysburg. By Carl Whitehill – In many ways, the Gettysburg home of Dwight and Mamie Eisenhower isn’t much different than that of you and I. The Eisenhowers were known to be rather modest with their home, even as the 34th President and family celebrated the holiday season every year. Staff at the Eisenhower National Historic Site (ENHS) let us in on a few of the holiday traditions of Gettysburg’s first family – from the decorations to the guests that would visit the presidential retreat during the season.